The property was very well laid out and very spacious. Facilities were excellent and the apartment well located for the town,. The host was extremely helpful and a delight to meet. The only issue is that there are six flights of steps and no lift. No problem for us (the exercise was good!) but some may want to bear this in mind. 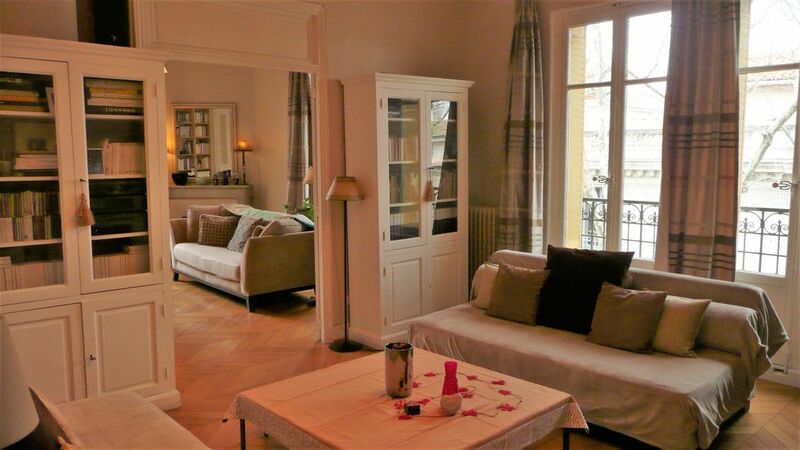 Lovely, well equipped apartment - quiet but very central street. Very handy for bus and train trips out of Avignon. Apartment is decorated with the artist owner's work! The appartment is even better in life than in photos. Not always the case. Great location: convenient to train, pedestrian areas and major sites within a short walk but in a quieter location than main tourist area. Les Halles close by also as well as Office de Tourisme. Proprietaire Laurie was very kind and helpful and readily available when needed (we stayed a month so there were a couple if questions we had). Not an issue for us but potential renters should be aware that it is a 3 flight walkup without an elevator. For us it was good to help work off the wine and great meals we enjoyed in town! We would definitely want to stay here again. Merci beaucoup, Laurie. An enjoyable week's holiday. Our host Laurie Salomon was very kind and helpful. The apartment is in an ideal location for walking to the city or to the buses and trains. Supermarkets are within walking distance and so also is the local food market . The tourist information centre is open every day and is just at the top of the boulevard. We hope to return. The apartment is spacious and airy. It is beautifully presented and provides a quiet retreat at the end of a busy site seeing day. It is well equipped for cooking your own meals with produce from Les Halles or very close to the city centre where there is a vast choice of restaurants. Mme Salomon welcomes you to Avignon and ensures you have a great stay. Thank you for allowing us to rent your beautiful home. Die Wohnung ist SEHR groß und sehr geschmackvoll eingerichtet, so dass man jeden Raum genießen kann. Es ist wirklich auch alles da, man fühlt sich wie daheim. Mme Salomon ist sehr nett und hat uns bei unserer Ankunft alles erklärt. Dass die Wohnung im dritten Stock ohne Aufzug liegt, empfanden wir nicht wirklich als Nachteil. Es ist ein sehr schönes altes Gebäude mit schönen Treppen. Wir sind ohne große Anstrengen hoch und untergelaufen. Inmmerhin ist man in Avignon und Avignon hat genug alte Sachen.